Daara J means ‘school of life’ and for the three young men from Senegal (N’Dango D, Aladji Man and Faada Freddy) that make up this African/Ragga Hip-Hop group, consciousness and exposing the truths of the world are the most important aspects of their musical message. Everyone in the United States correlates the roots of hip-hop as originating in the Bronx, New York, or the purists would go back farther to Jamaica in the West Indies. However, before any link can be made to hip-hop roots, one must always realize the roots to any black music form must be traced to the Motherland. That is naturally Daara J’s stance, and it’s not an arrogant one – they simply use it to showcase the essence from where all this unique tongue-twisting talents are derived. Although Daara J is very proud to ‘look up’ to all the hip-hop pioneers and stalwarts from America, the group addresses their lost brothers and sisters in America and the Black Diaspora who have been detached from their true African culture for the past 400 years. Daara J, as the opening act to Mos Def and Femi Kuti, showed the Hollywood Bowl in Los Angeles an energy that left the crowd standing to their feet. Most opening acts seldom see such a response, but this KCRW’s World Festival Night show was an exception. 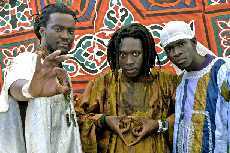 The group performed new material from their American debut release, Boomerang (Wrasse), and frankly, it was plain to see that when Mos Def and Femi Kuti hit the stage sometime after, the concert line-up should have been in reverse – boomerang style. -With all the fruits of Africa – that being Black music in all its forms – you still find that African artists tend to get very overlooked. Is Daara J trying to reverse the scenario, hence the title of your LP, Boomerang? -How long has your group been waiting for this ripe opportunity? -How’d you get in touch with hip-hop, way back in the late 1980’s being way over there in Senegal, Africa? FF: “It was very difficult at the same time because at that time when you wanted to incarnate such music as hip-hop, nobody would lend you the space to do it or give you space. They judged that this kind of music was kinda weird music and it was uprooted. And that’s why we weren’t allowed peacefully to incarnate that music. Whenever we wanted to do freestyle and stuff like that, people would just say ‘No! You can not do this because you gonna preach some gangster stuff here, you gonna preach some bling stuff, violence.’ But we really came a long way to finally give it back to hip-hop and show the people that hip-hop is more than preaching violence, more than bling bling, but it was a part of our culture. And slowly people got involved because of the heavy weight messages that we used to tell. -Hip-Hop is just one of the many branches of the African musical expression amongst an array of other forms of music whether it be dancehall, soca, reggaeton, calypso, cumbia, etc. Why your gravitation towards hip-hop and not some other art form to express? -Performing throughout the U.S., what has been the crowd responses to you as artists, but also to you as an introduction to African hip-hop? -I think for Americans in general, it’s hard to believe 3 guys from some far away country like Senegal, can reinterpret their hip-hop in any way to be taken seriously. How do you dispel that myth that foreign hip-hop is just ‘experimental’ or ‘irrelevant’ to humankind? -So in other words, the best way to get across your message – to the U.S. massive at least – is to remind them that when they are looking at Daara J, they are looking at themselves. FF: “That’s it, that’s how it should be,” he confirms with a laugh. -In Senegal, it’s called ‘Tasso’ yet in other parts of Africa, I’m sure oratory poetry may be called something else but is basically the same. 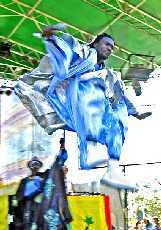 Do you think just one African country, that being Senegal, can solely claim this direct link from ‘Tasso’ to hip-hop? 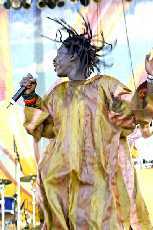 -Back home in Senegal, are you fueling a strong conscious hip-hop movement, despite the forceful influence and penetration of negative American hip-hop and rap that the youth are so prone to gravitate to? Daara J’s latest release is entitled “Boomerang” [Wrasse Records, 2004]. It’s available online at Amazon.